I need help in indentification of this tree which bears yellow fruits. Are these fruits edible? The tree has long oval dark green leaves. You can see yellow fruits end of May, and in June. The photo is taken in Europe, France. I saw many trees like this around just outside in the streets. 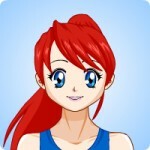 Maria Doctor Asked on June 16, 2016 in Fruits, Trees. Seems it is Eriobotrya japonica aka Loquat. It is also known as Japanese plum and Chinese plum.The loquat is a species of flowering plant in the family Rosaceae. It is an ancient fruit grown in Japan for the past 1,000 years. 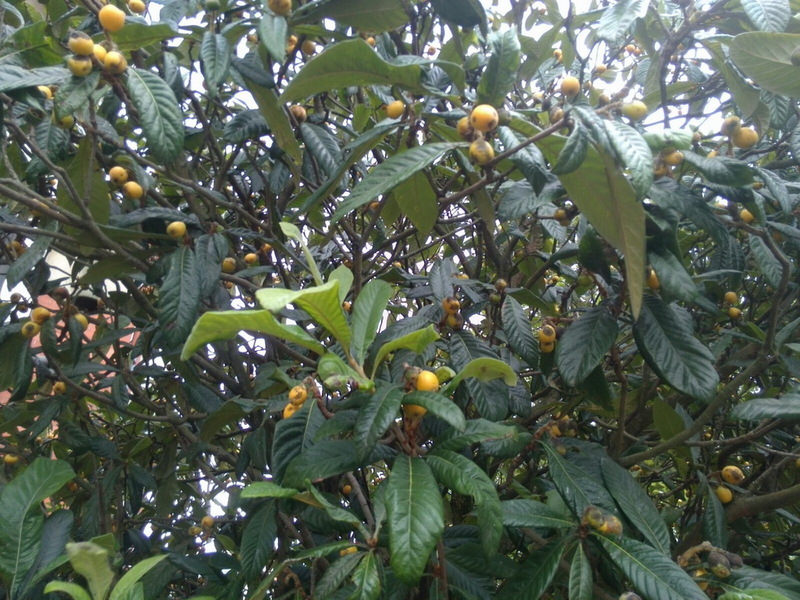 Loquat is probably native to the cooler hill regions of China to south-central China. This plant is interesting, because of its unusual flowering and fruiting time. loquat flowers appear in the autumn or early winter, and the fruits are ripe at any time from early spring to early summer. Eriobotrya japonica is grown commercially for its yellow fruit, and also cultivated as an ornamental plant. The flowers have a sweet, heady aroma that can be smelled from a distance. The fruits are edible and the sweetest when soft and orange. The flavour is a mixture of peach, citrus and mild mango. 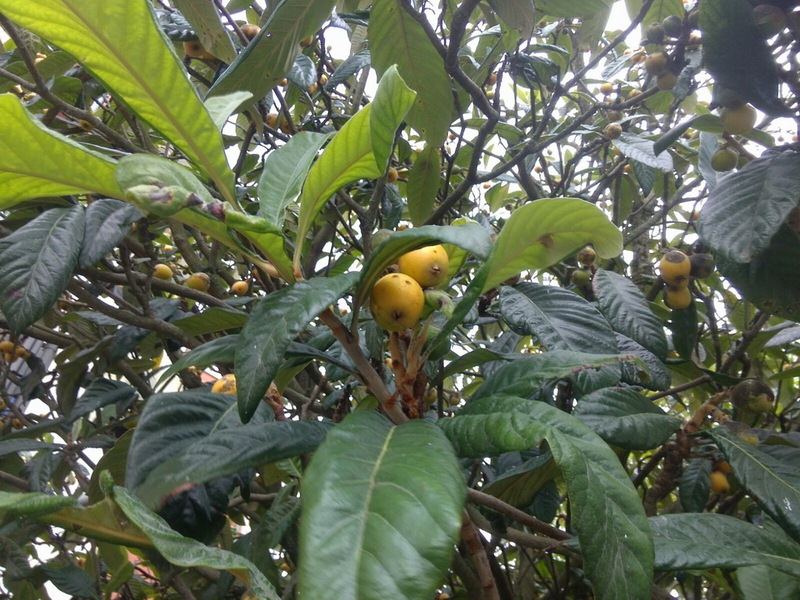 Loquat fruit is eaten fresh alone or in fruit salads or fruit cups. The fruits are also commonly used to make jam, jelly, and chutney, and are often served poached in light syrup. Firm, slightly immature fruits are best for making pies or tarts. Traveler Vice Professor Answered on July 17, 2016. Yes it is Loquat. Loquats can also be used to make light wine 🙂 It is fermented into a fruit wine, sometimes using just the crystal sugar and white liquor. In Italy nespolino liqueur is made from the seeds, kind of nocino and amaretto. But loquat seeds similar to the apricot kernels contain cyanogenic glycosides, so the drinks are prepared from varieties that contain only small quantities of these cyanogenic glycosides (such as Mogi and Tanaka), so you don’t need to worry as there is no risk of cyanide poisoning. Mark Reviewer Answered on July 17, 2016.